5/3 Cup of Coffee: Saturday was a good day from top to bottom for the Red Sox minor league affiliates, which combined to go a perfect 4-0. 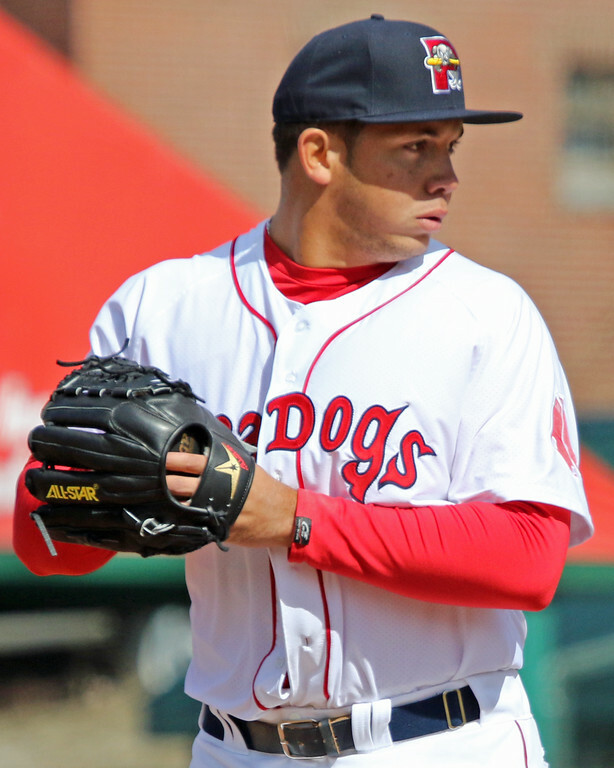 The pitching was particularly good, as Eduardo Rodriguez continued his dominance for Pawtucket and a handful of lower-level hurlers – namely Portland's Jonathan Aro (pictured, right) and Salem's Daniel McGrath – made the difference for their respective clubs. Second baseman Sean Coyle's solo home run in the bottom of the fifth broke a 1-1 tie and was enough to earn the PawSox a narrow 2-1 win. Jackie Bradley Jr. had a solid showing at the plate and in the outfield, throwing out a Durham runner at the plate and knocking in Pawtucket's first run of the game on an RBI single. Bradley finished 2 for 4 with a double, and continues to be the PawSox most consistent offensive performer so far this season with a .333/.393/.432 slash line through 20 games. Speaking of consistency, starter Eduardo Rodriguez improved his record to 3-0 on a solid six inning effort. The left hander allowed seven hits but limited the damage to just one run while striking out six. Jess Todd and Heath Hembree combined for three scoreless innings in relief, with Hembree earning his third save of the season. Left fielder Keury De La Cruz paced the Sea Dogs offensively, knocking in three RBI and finishing 2 for 4 with a double and one run scored. Third baseman Oscar Tejeda also posted a multi-hit game, going 2 for 5 with a double and two runs scored. Starter Justin Haley pitched only 1/3 of an inning before leaving with an injury. Right hander Simon Mercedes filled in admirably in relief, going 4 2/3 innings while allowing one run on three hits and striking out two. Jonathan Aro closed out the win in style, facing only 12 batters in his four perfect innings of work and striking out three. Aro earned the win to improve to 3-1 on the year. 2014 second-round pick Sam Travis finished 3 for 4 with an RBI to help lead a terrific offensive showing for Salem. Tzu-Wei Lin turned in a three-hit performance of his own, finishing 3 for 4 with an RBI triple that plated center fielder Manuel Margot. Margot went 1 for 5 out of the leadoff spot, while designated hitter Cole Sturgeon finished 1 for 2 with an RBI double. Salem combined for 14 hits on the night. Australian left hander Daniel McGrath, a 2013 International free agent signing, went six scoreless innings that included six strikeouts and just three hits. The 20-year-old was SoxProspects.com's Rookie of the Year in 2013. Jorge Marban allowed both of Potomac's runs in the top of the seventh and was replaced after two innings by right hander Austin Maddox, who earned the save. First inning RBI from Michael Chavis, Rafael Devers and Javier Guerra helped the Drive jump out to an early lead, which it would hang on to for the rest of the night. Chavis had the best night of the three top prospects in Greenville's lineup, going 1 for 4 with an RBI, one run scored and a stolen base. Ben Moore also showed well at the plate, finishing 3 for 5 with a triple and three runs scored. Right fielder Nick Longhi went 2 for 4 with an RBI double hitting out of the cleanup spot. 19-year-old left hander Dedgar Jimenez earned his first win of the season, tossing five innings and giving up three runs on five hits and striking out five. Reed Reilly was surgical in relief, throwing four scoreless innings and striking out five to earn the save. Player of the Day: Losing a starter 13 pitches into a game and still pulling out a win is no easy feat, but that's exactly what Portland did last night thanks in large part to a terrific performance from Jonathan Aro. The 6-foot-1 right hander came on in the bottom of the sixth with the game tied 1-1 and threw four perfect innings, giving the Sea Dogs enough breathing room to build a lead. Aro earns Player of the Day honors not only for his performance, but for how well he handled the strange circumstances that forced him into extended duty.